We Sell and service all BSD Sail Products and are Long Haul Folding Kayak dealers.We also rebuild other folding kayaks including Klepper and Pionier. Our BSD or (Balogh Sail Designs) sail kits are the best upwind rigs and have been on the market since the late 80's. 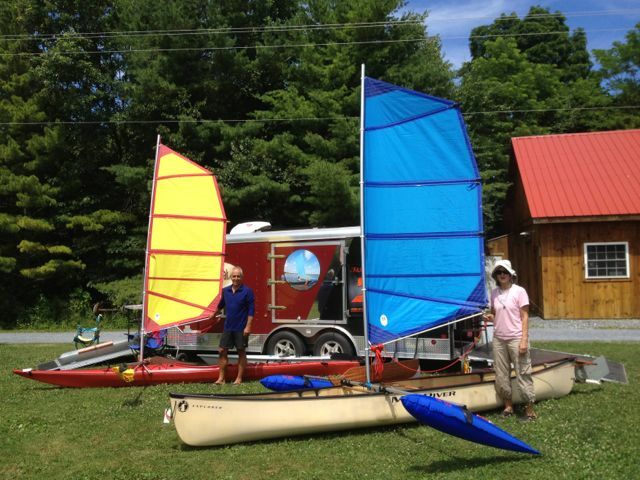 They are made in USA and are able to turn your canoe or kayak into a sail boat. We have stock on hand to install a kit on your boat in our shop in Central Vermont or at any of our show locations. Give us a call anytime to discuss your plans. We will do our best to deliver a boat in New England or the East Coast to Florida. Our company is based on the belief that our customers' needs are of the utmost importance. Try our Sail Your Kayak channel on Youtube for several videos. We are always adding more. breeze in the coming week. Good job!! Thanks much, Rick. Thanks for the great help and tips during the 2012 everglades challenge. Thank you for taking the time and going over my set up before take off. I really appreciated it. Hope to see you again soon.